Grace Davidson began her formal ballet training under the direction of Rebekah von Rathonyi at Peoria Ballet at the age of five. 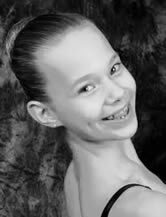 She is currently training at the Faubourg School of Ballet, under Watmora Casey and Tatyana Mazur. Ms. Davidson has competed in the YAGP for 3 years. In 2010, she was awarded the Hope Award at the YAGP 2010 Chicago, IL Regional Semi-Finals. In 2011 she repeated this feat and was also awarded the Hope Award at the NY Finals of 2011, where she had the honor of dancing on the New York City Center Stage in the 2011 Gala – “Stars of Today Meet the Stars of Tomorrow”. She has performed in numerous student productions and the Festival Ballet Theatre’s Gala of the Stars in California. Although Grace loves to dance and perform for audiences, one of her greatest pleasures has been helping to teach a creative movement class to autistic children.